Taking a great many Christmas photos and possibly thinking if only there is a solid program to create Christmas slideshow? The long-expected Christmas is quietly approaching. Image how warm and sweet Christmas is when your beloved family sits around you to sing Christmas Carol, watch hilarious Christmas movie and enjoy the delicious turkey together. These warm and touching moments are so precious worth of being captured and preserved forever. No wonder it's widely said Christmas is just the season with chock-full of photo-taking opportunities. If you want to liberate still Chrstmas pictures from the jail to create a vivid video slideshow for sharing with others, go on reading the post. There exists a versatile photo video maker-MacX Video Converter Pro standing out of the bunch. MacX Video Converter Pro is a professional photo slideshow creator to endow you to make Christmas slideshow and transfer motionless Christmas photo collections to a vivid Christmas photo slideshow video on Mac OS (macOS Mojave and earlier) and PC (Windows 10). It also grants you to free edit your Christmas photo video by freely selecting various special effects, choosing the photo interval and adjusting their orders. And you are able to add some Christmas songs, such as Christmas Carol or Merry Christmas Everybody and so on to personalize your video. Alongside making Christmas slideshow video, MacX Video Converter Pro has an ace up its sleeve that it's a full-throttle video converter competent of converting among HD videos and SD videos, namely, MTS to MP4, M2TS to MOV, MKV to 3GP, FLV to AVI, etc. so as to let videos playable on iPhone XS/XR/X/8/7/7 Plus/6S/SE/6/6 Plus/5S/5C, iPad Air 2/Mini 4, iPod, Android Devices, Microsoft Devices and more. Its inherent optimized advanced tech guarantees No.1 fast speed and untouched quality. Creating vivid Christmas photo slideshow through a humanized program interface, MacX Video Converter Pro walks you through this creating process that you just need 4 clicks and let it take care of the rest for you. Step 2: Select the output format for your Christmas photo movie. Step 3: Click "Browse" button to choose the destination for your Christmas photo slideshow video. Step 4: Press "RUN" button to commence the creating process. Apart from barely creating Christmas photo slideshow, in case you are eager to create a Christmas tutorial video about how to decorate Christmas tree or make a delicious turkey for sharing on website, MacX Video Converter Pro can also do you a great favor. It can function well as a camcorder video maker with its internal video to allow you to record any one-of-a-kind Christmas videos to upload to YouTube, My Space, Vimeo, etc. for sharing with others. Supposing you aspire to download Christmas movies, funny videos from YouTube, MacX Video Converter Pro is also your optimal choice that empowers you to download top 10 Christmas movies or other entertaining videos from YouTube, Vevo, Vimeo, Dailymotion, etc 300+ sites in a fraction of mins and spend merely 30 seconds to download a red-hot Christmas carol music video. If you wanna transfer your iPad iPhone iPod photo to computer preparing for slideshow video making, you are advised to take advantage of MacX MediaTrans to easily move photos from iDevices to Mac/PC. What's more, this iOS file manager also can aid you to copy the created Christmas video from computer to iOS devices for playback on the move. Here we put together a list of top 10 Christmas moves to watch at Christmas which are conformity with the Christmas spirit and wish you would enjoy watching them. In this article you will get a step-by-step guide on how to rip DVD to HTC, and watch DVD movies on Android based HTC phones with best video quality using DVD to HTC ripper on Mac. 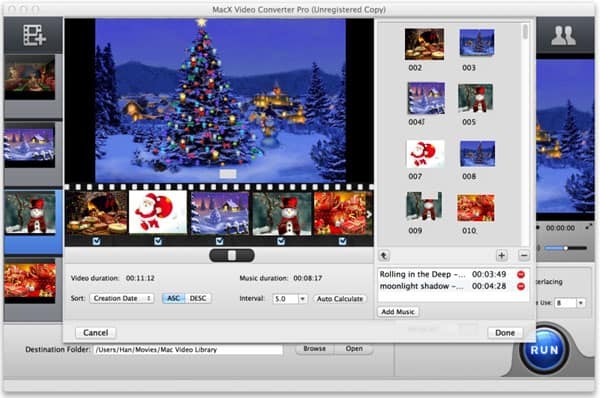 MacX Video Converter Pro is a functional Christmas photo slideshow creator with top quality and fast speed. With the aid of this feature-rich slideshow maker, you also can freely download Christmas movies/videos and convert them to mobile devices.